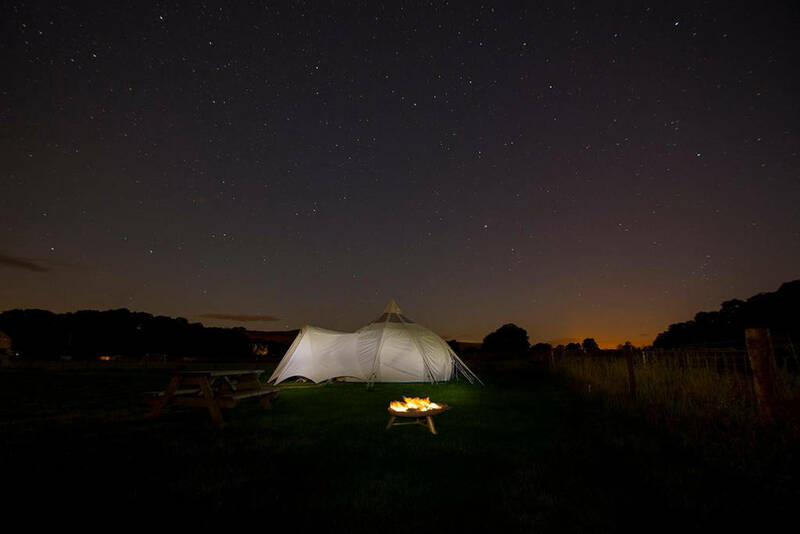 Glamping in Teesdale…….if you don’t have a tent and want to try camping, or if you don’t fancy packing your car up with a wet tent at the end of your holiday or if you simply want something a little more luxurious than a camp bed, book up and check in to our Stargazer Lotus Belle Tent for a few nights. With a proper double bed frame and a proper double mattress plus our handmade picnic bench, mood-setting fairy lights, plates, bowls, cutlery, mugs, glasses, BBQ tools, portable single gas stove, kettle and not to mention your own fire pit (we provide you with one bag of wood) – there’s quite a lot included with our Stargazer Lotus Belle Tent. There is no electricity in the Stargazer Lotus Belle Tent, but there are fairy lights and battery powered eco bulbs and the all-important feature of uncovering the windows at the top of the tent so you can gaze at the stars. This tent will be perfect for ‘dark skies’ regions and fans of astronomy or for simply viewing the night sky. The Stargazer has 360 degrees of transparent panels located around the roof canopy to give the best view of the sky whilst maintaining privacy within. It also features clip up curtains which can obscure the sky panels when needed. 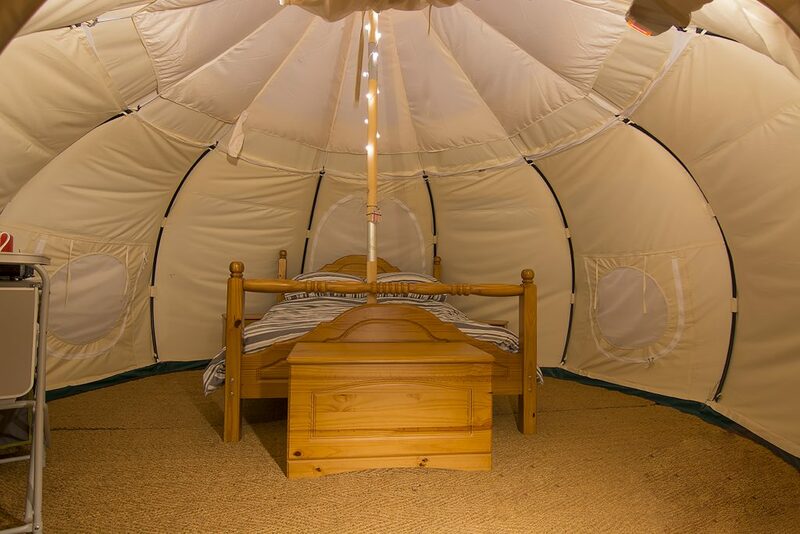 The tent comes with two canvas doors, each with a mosquito net door behind. It has roll down canvas blinds with zip open PVC windows to keep out heavy rain, and behind them, a mesh layer to keep out flies and allow maximum air flow in the hot summer. It offers the perfect balance of being able to look outside and keep dry on wet summer days, and open up to create a through draft when it gets a little warmer. 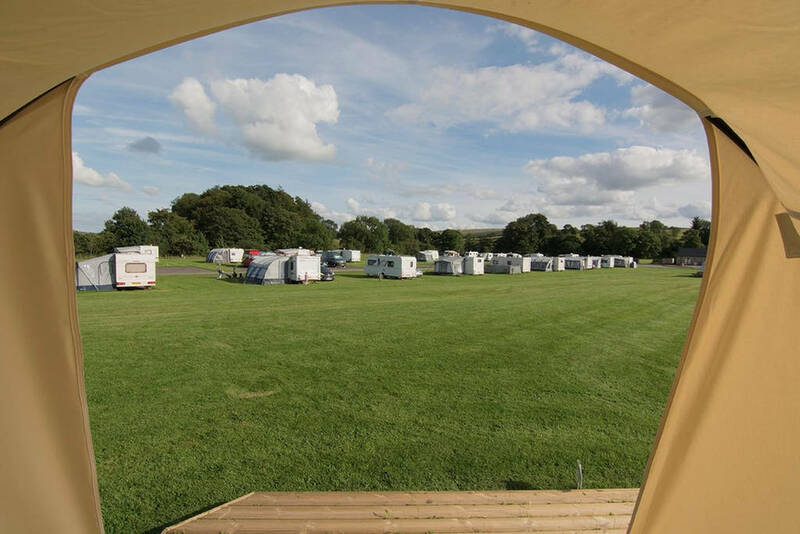 To maximise breathability the Stargazer has large roof vents and a Velcro in groundsheet to keep out all the bugs. It has a 4 meter base diameter and 4.5 meters at waist height. The height at the edge of the tent is 5’8″, meaning the whole floor space is usable standing height for most people. The 8mm thick coir flooring to the interior is very hard wearing and adds an insulating layer to your floor. It provides a lovely rustic feel. We have also added a porch awning to our Stargazer Lotus Belle Tent to extend your living area outside! We suggest bringing some utensils, pots, and pans to cook with. You will need to bring your own bedding. It can get a little cool during the night, even in mid-summer so bring a nice warm duvet. Other items you will need to bring with you include dishcloths, washing up liquid (we provide a washing up bowl), gas canisters (we provide you with one full one but you may need more, we sell them in the shop), and perhaps a sun lounger to relax on the decked area outside your Belle tent. We also recommend you bring slippers or similar footwear to wear inside the tents as we ask no outdoor shoes are worn inside. For all bookings, there is a 2-night minimum stay and 3-night minimum stay for ALL bank holidays. 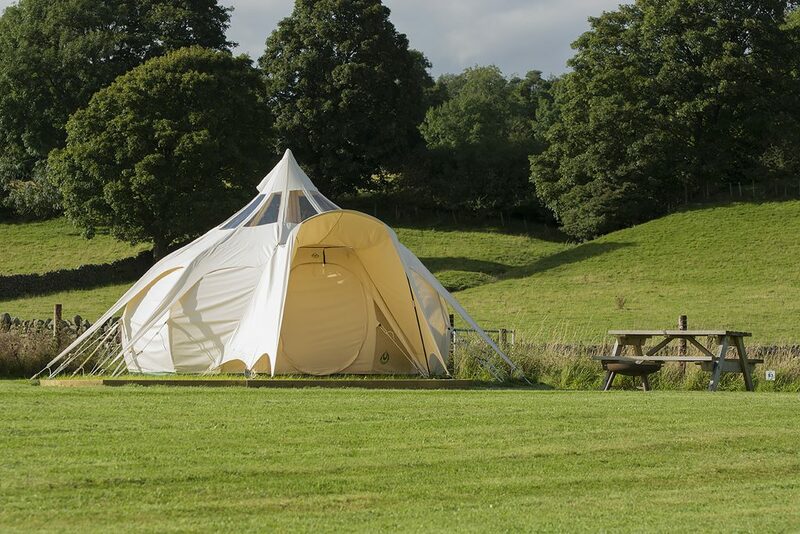 Prices for the Belle tent start from £45 per night for 2 people. Arrival time is after 3pm and departure time is by 10am – this gives us time to clean and prepare for new guests.